Each week for the next 10 weeks you can win back up to £500 of your holiday money when you buy your travel money from us. For example if you purchase £250 worth of currency, that would be the amount you could win back. Customers who transact with us online or in branch between 1st July and Saturday 15th September 2018 have the chance to enter. Customers who complete a Pay & Collect, Reserve & Collect or Home Delivery order online can automatically enter themselves into the prize draw by clicking the link within the email receipt. Customers who purchased currency in branch can enter by completing the form on the 'Entry Form' tab. The weekly winner will be drawn each Monday morning and announced by 9.30am on the 'Winners' tab and elsewhere on our website, on our social media channels and in branch. Good luck! See below for full terms and conditions. The Splash Your Cash Prize Draw is open to UK entrants over 18 years of age only. 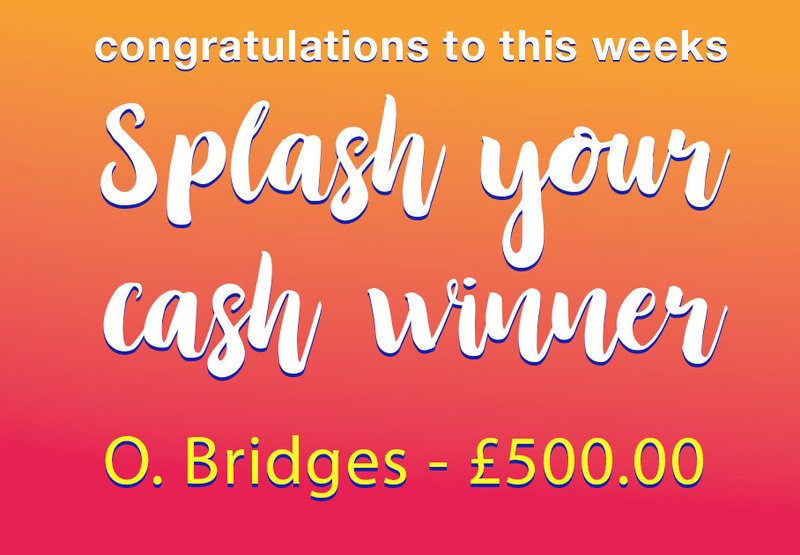 The Splash Your Cash prize draw will run from 1st July 2018 until 15th September 2018. Employees of NM Group, eurochange and associated companies and their immediate families are not eligible to enter. The Prize Draw starts on Sunday 1st July 2018 and the closing date for the final week's prize is Saturday 15th September 2018. Every customer who completes a currency purchase online or in branch during this period will have the chance to enter in the prize draw. One customer per week for the next 11 weeks will have the chance to win back their order amount up to the value of £500. To be eligible to enter you must complete a currency purchase, online or in branch with eurochange between Sunday 1st July 2018 and Saturday 15th September 2018. There is no entry fee and only a purchase is necessary in order to enter the Prize Draw. Customers who purchased currency in a eurochange branch can enter by; going onto the eurochange website, locating the Splash Your Cash entry form and inputting the following details: First Name, Surname, Email Address and the Receipt Number. Customers who purchased currency through the eurochange website can automatically enter themselves into the prize draw by clicking the link within the email receipt. NM Group, eurochange and associated companies accept no responsibility for entries which are not received, lost or delayed whatever the reason. There will be 11 winners in total and only 1 entry per transaction will be accepted throughout the 11 weeks. The weekly winner will be drawn at random each Monday morning for the next 11 weeks and announced on the eurochange Social Media pages (Facebook, Instagram & Twitter), eurochange website and on the plasma screens in branch by 9:30am. Week 1 starts on Sunday 1st July 2018 at 9:00am and finishes on Sunday 8th July at 23:59. Weeks 2 to 10 will follow the same pattern and week 11 finishes on Saturday 15th September at 23:59. Winners will be notified using the contact details provided when completing the online entry form. It is the responsibility of the entrant to ensure these details are correct. If the winner fails to respond within 21 days we will select a new winner. If the winner fails to collect the prize within 6 weeks from the date of the winner being announced and contacted we will select a new winner. There will be eleven winners and each winner will back their transaction amount up to the value of £500. For example: if the amount purchased was £250 worth of currency they could win back £250. The winner must provide a copy of the transaction receipt, this can either be an email or branch receipt. We will require a proof of ID for the winner to successfully claim the prize as proof of age. The prize must be collected from a eurochange branch and the winners may be asked to participate in marketing activity via web and social media, this will include a photograph being taken when collecting the prize. The prize will be paid in a foreign currency of the customer’s choice in notes or loaded onto a Multi-Currency Cash Passport. GBP is not classed as a foreign currency. Where a branch does not stock the currency of your choice we will arrange for the foreign currency to be delivered. Due to currency exchange rates and available denominations, the amount received might be slightly over the amount due. The prize is not transferable to another person and the prize is not exchangeable for another prize. If the advertised prize is not available, we reserve the right to offer an alternative prize of equal or greater value. Data relating to the prize draw and entrants will be retained by NM Group, eurochange and associated companies for three months after the final prize draw closing draw date to operate the Prize Draw in a consistent manner and to deal with any queries. NM Group, eurochange and associated companies will never sell or pass your details to any third party. NM Group, eurochange and associated companies are not responsible for inaccurate giveaway and prize details supplied to any entrant by any third part connected with this prize draw. NM Group, eurochange and associated companies reserve the right to cancel or amend the prize draw and these terms and conditions without notice. This Prize Draw is in not sponsored, endorsed or administered by, or associated with any third party. You are providing your information to NM Group, eurochange and associated companies and not to any other party. The Prize Draw Terms and Conditions are governed by English law and entrants to the Prize Draw submit to the non-exclusive jurisdiction of the English Courts. Our Splash your Cash promotion has now ended. Thank you to all those that entered and congratulations to the winners! The winner for week 11 can be seen on the 'Winners' tab.